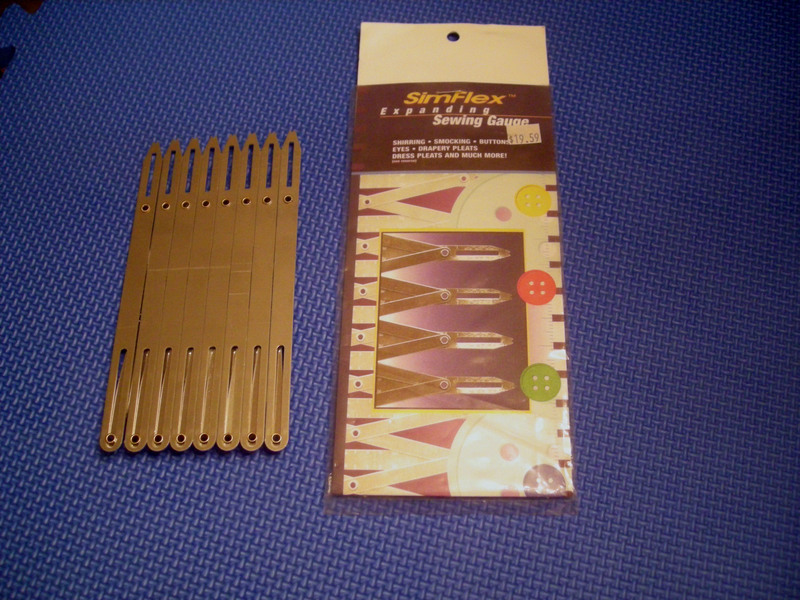 I bought this really cool gadget at a sewing expo, and I never add buttons without it. It’s handy for sweaters, shirts, skirts — any kind of garment, any kind of fabric, as long as the button band is straight rather than curved. This is basically a metal accordion doohicky with helpful pointy bits on the end. Those helpful point bits are two-pronged and manage to be about the same width as the holes in a 2-hole button, which makes aligning buttons very easy. 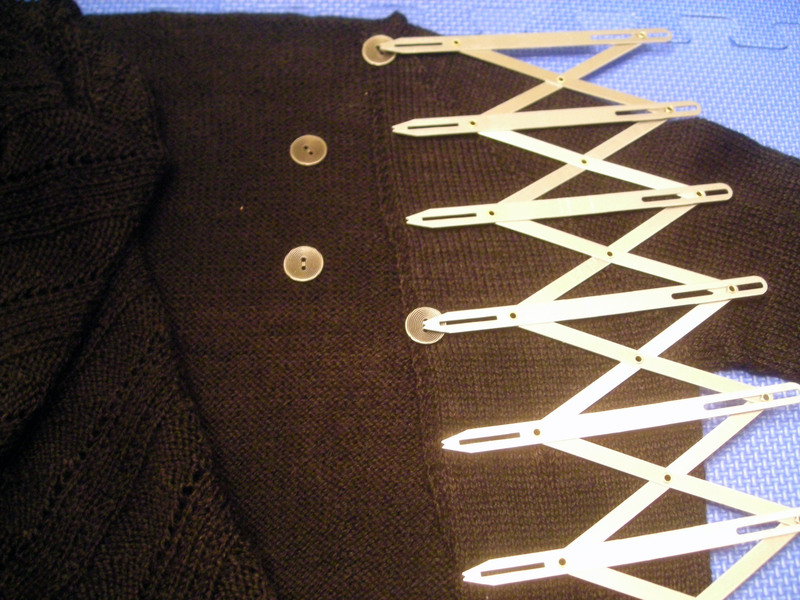 For my Dark Pearl cardigan, I used the top and bottom hem to mark the top and bottom button placement and sewed those into place. Then I used the doohicky to mark the placement of the other buttons. All you have to do is expand the accordion to match whatever you’re doing — here, I use the top and bottom buttons as my guide, and the middle two prongs mark the spots for the other two buttons. No tape measure required! This tool was a little pricey, almost twenty bucks, but it is worth every penny. No more trying to do math in my head as I try to divide inches by eighths! Just point the prongs, mark, and sew. Perfect results every time. Forgive the headless selfie — let’s just say I’m looking for a new hair stylist and leave it at that. I’m very pleased with how this cardigan turned out. There were a few rough moments with the ugly yarn, but a bit of dye took care of that, and the sweater fits beautifully. I love the way the lace panel drapes across the yoke, and I can imagine wanting to wear this one All The Time. 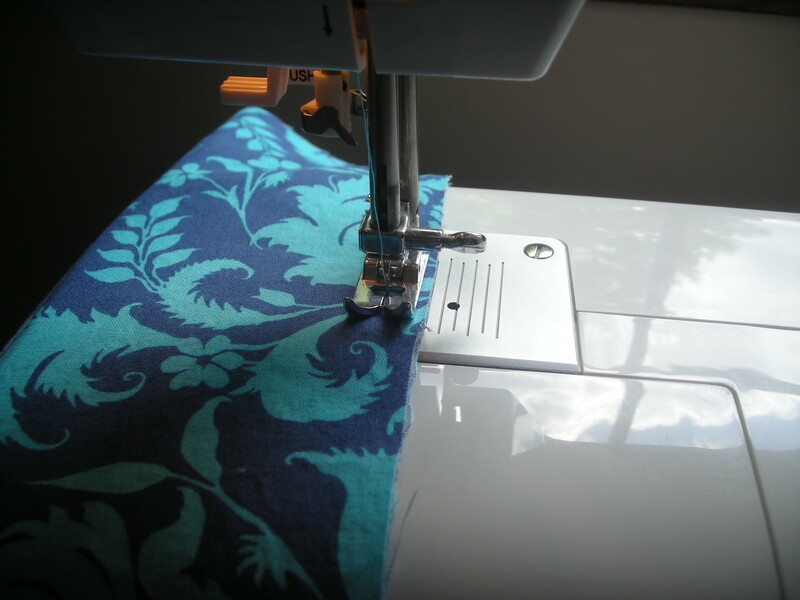 What sewing gadgets do you love? Have you ever splurged on a gadget and discovered it’s more an essential than a splurge? I’m working on my fitting muslin for the Vogue 1419 Ralph Rucci coat — this beauty, remember? 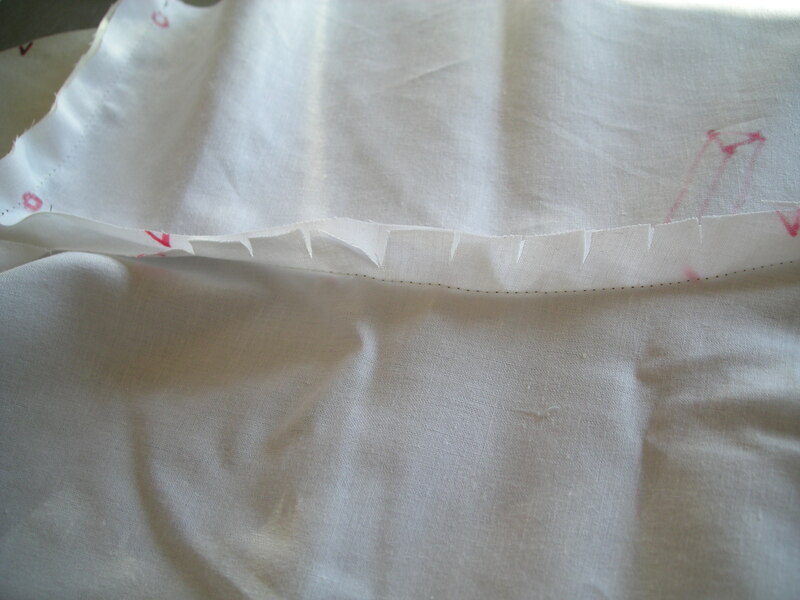 Anyway, I’m doing a fitting muslin rather than a construction muslin — that is, the purpose of my muslin is to work out any fitting issues rather than any construction issues. 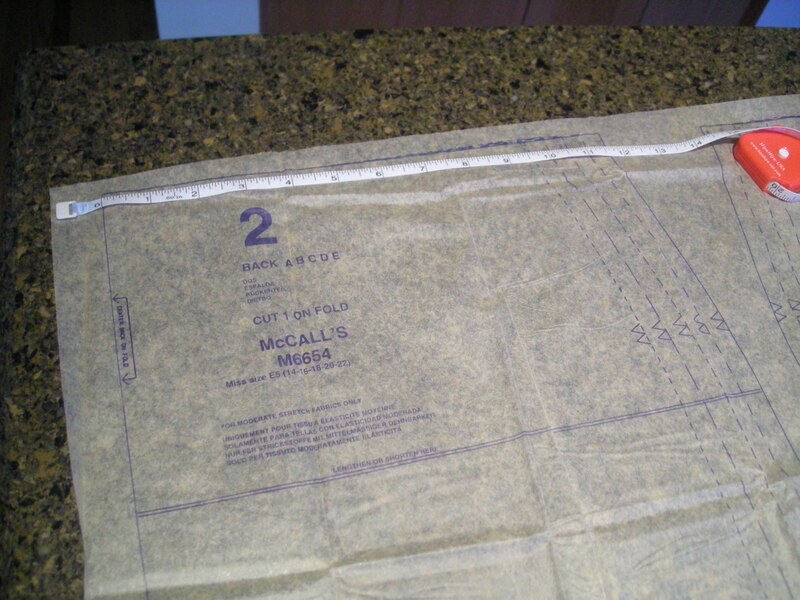 On the sew-along blog, they advocate making a construction muslin to practice all the construction techniques on this masterpiece pattern, and now that I’m actually looking at the instructions, I can see why. There are loads of techniques in this coat that we don’t often use in run-of-the-mill garment construction. 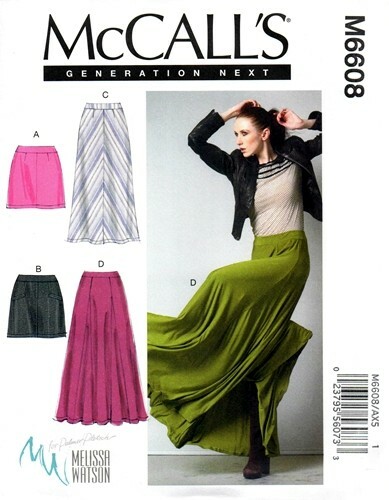 I have to give Vogue Patterns a lot of credit for these instructions, though. 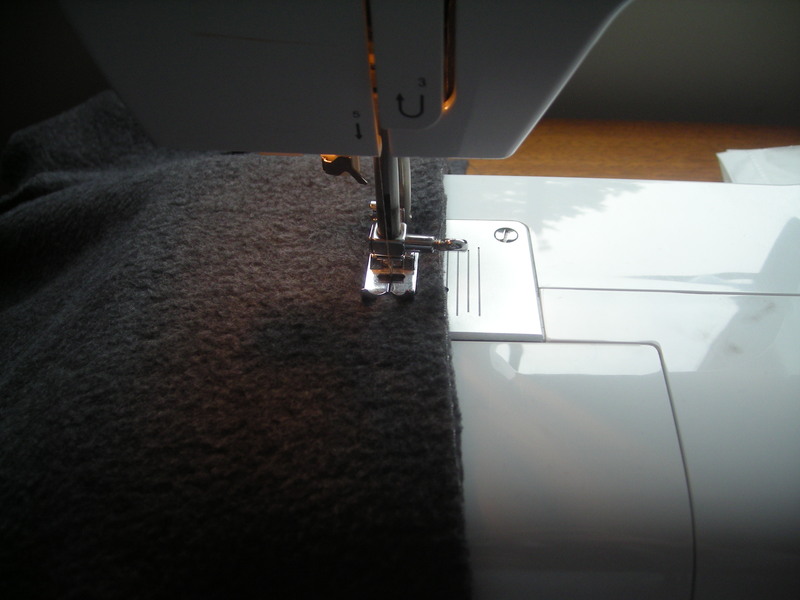 They throw in lots of small details to make the process easier, including a note to “clip seams if necessary” in different places. 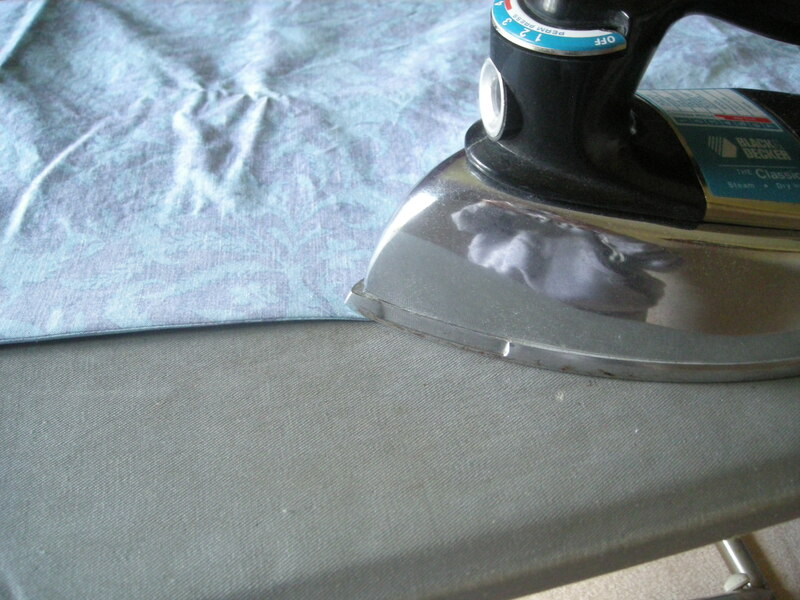 Here’s one of the place that clipping seams is necessary. 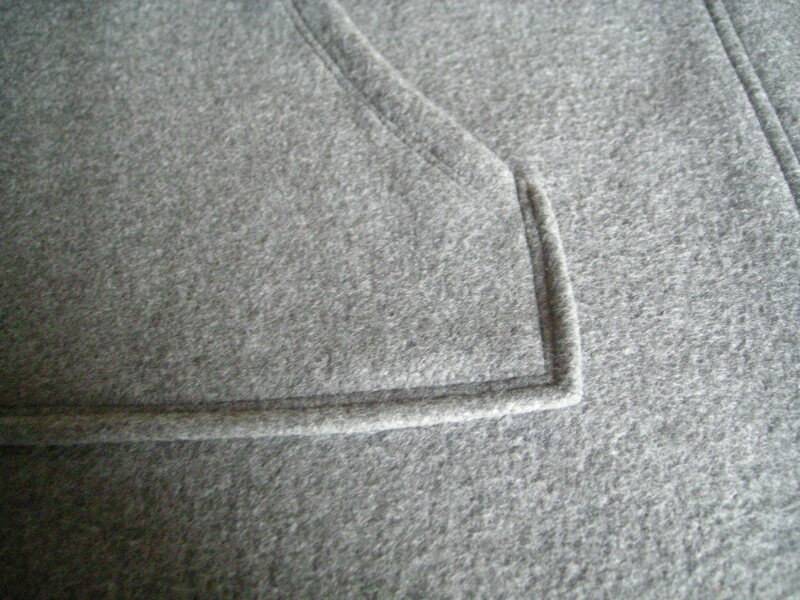 Here we join the side panel to the front panel along the side seam. Here, both pieces are face up — right sides showing. You can see the red notches that have to match at the seam lines. The top red notches look about parallel, but the bottom red notches are staggered by at least an inch. The curves on the raw edge are pretty smooth and fit together almost like a jigsaw puzzle. 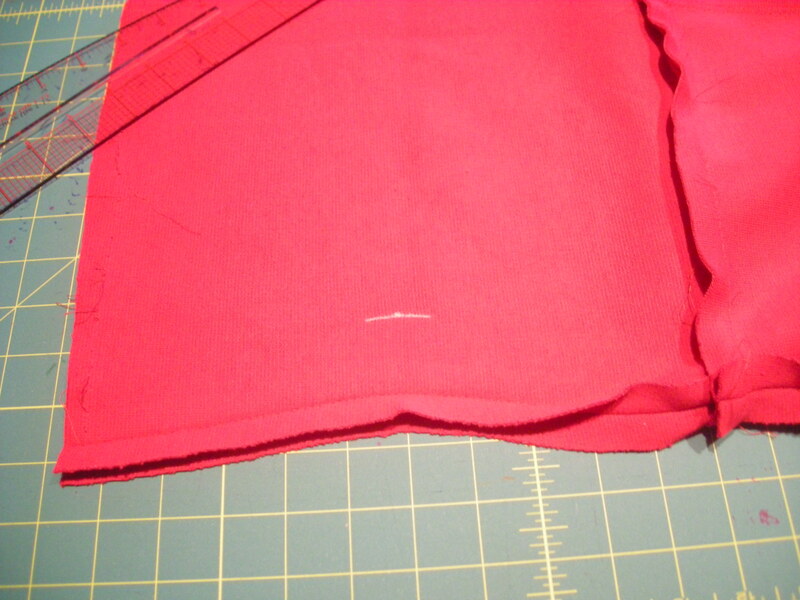 But look what happens when you put the right sides together to make that seam. I’m just going to flip the piece on the right on top of the left side piece — pay attention to the two small red dots between the notches, which will help you distinguish between these two muslin pieces. Those curves don’t line up so smoothly anymore. 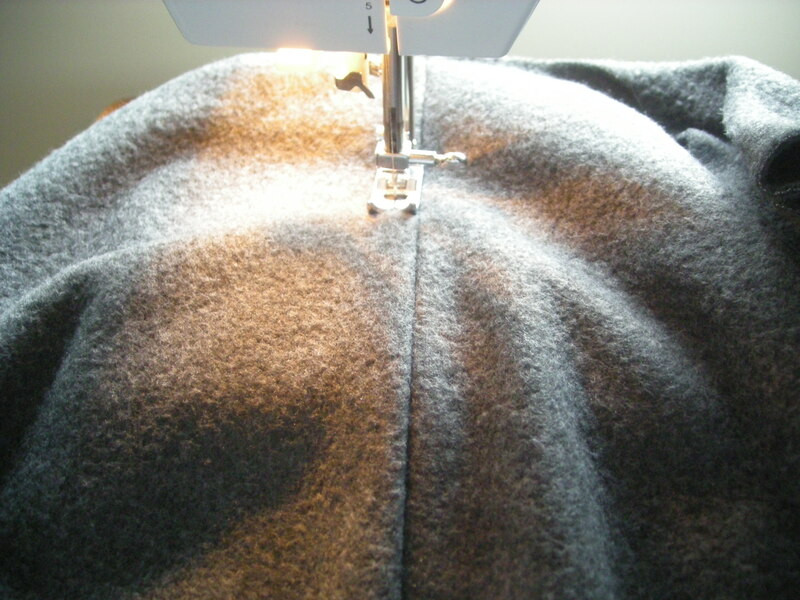 It becomes tricky to sew and tricky to keep the seam smooth there. 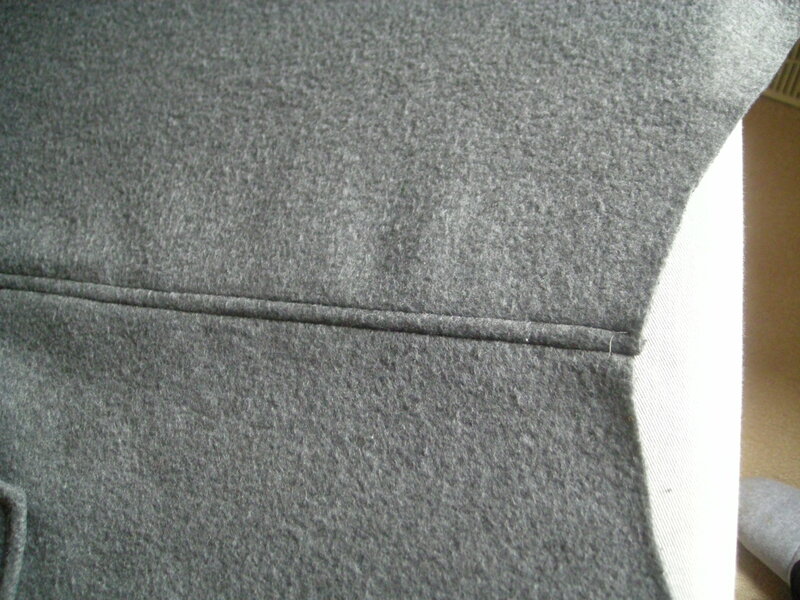 The solution is clipping the seam. 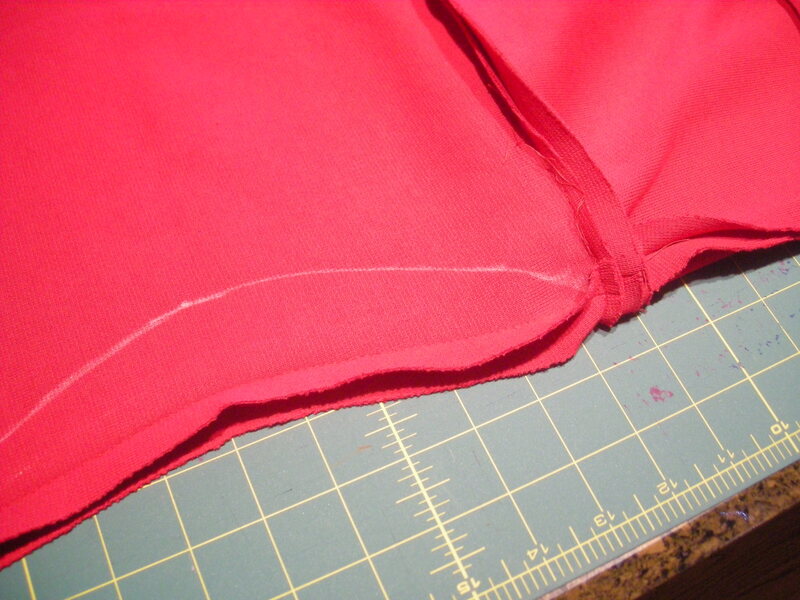 That would be the bottom seam — the curved piece to the right, the one without the two red dots. I always confuse the terms complex and compound, so forgive me for not being able to use to proper terminology here. 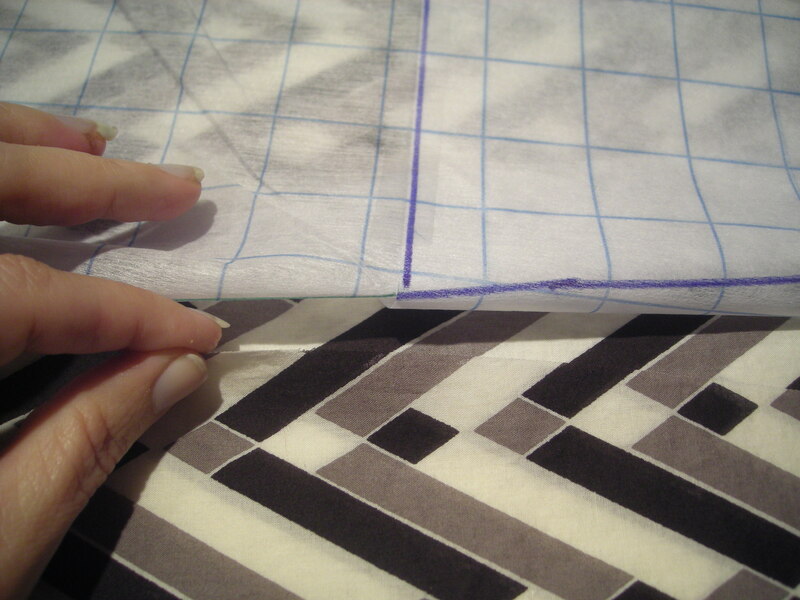 But that curve on the right piece, without the dots, will feel tight if you try to pull it into a straight line. 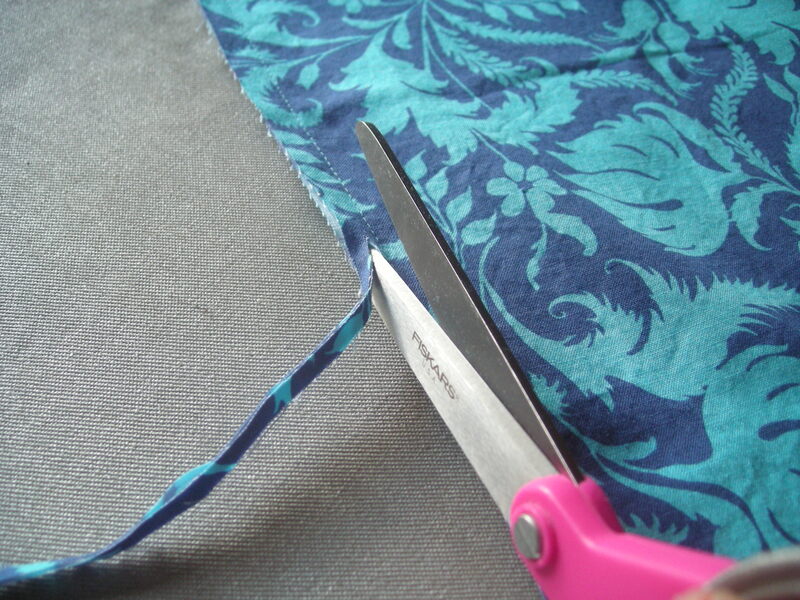 Frequent (1″ or less) clips into the seam allowance will let the piece stretch a bit so that you can match it to the other curve more easily. Just make sure you don’t clip through more than the seam allowance. You don’t even have to clip all the way to the seam line, as that picture shows. I find a notch of around 3/8″ is usually enough, but on particularly tight curves, deeper and more frequent clips might be necessary. And as you can see in this photo, I only clipped one of the two pieces. The other was fine as it was. In any case, once those clips are made, the notches are easier to match and the whole piece fits together just like a perfect jigsaw puzzle again. Just thought I’d mention this because we don’t always see the “clip where necessary” instruction in patterns, but we still might have to know when to do it. Curves, baby. It’s all about the curves. 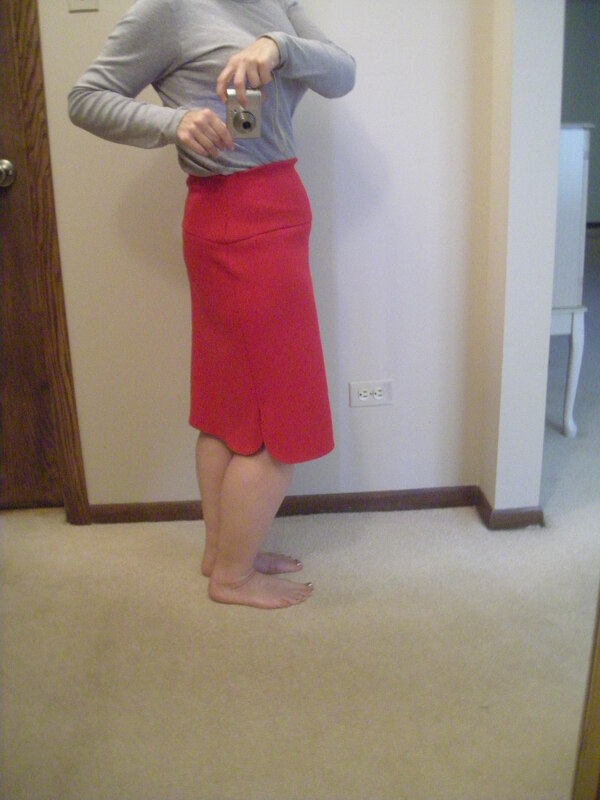 The other day, when I blogged about my 90-minute skirt, I mentioned that I removed four inches from the waist in the pattern. 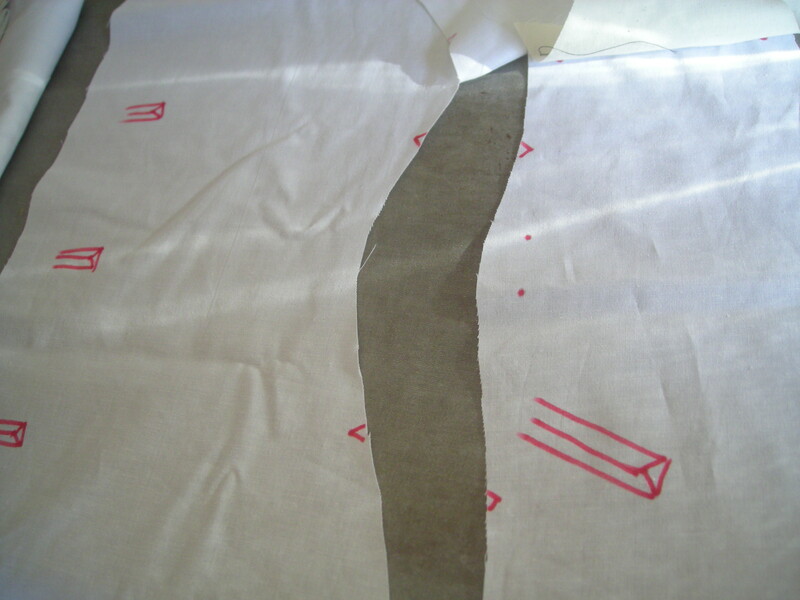 This alteration was made before I cut the fabric, an adjustment to the pattern itself. I find paper alterations to be easy and effective. They don’t take a lot of time and they make the final fitting easier. Here’s how I did this particular adjustment. All you need are a tape measure, paper, a drafting ruler, and a dose of self-awareness. I have several different kinds of paper I keep on hand. 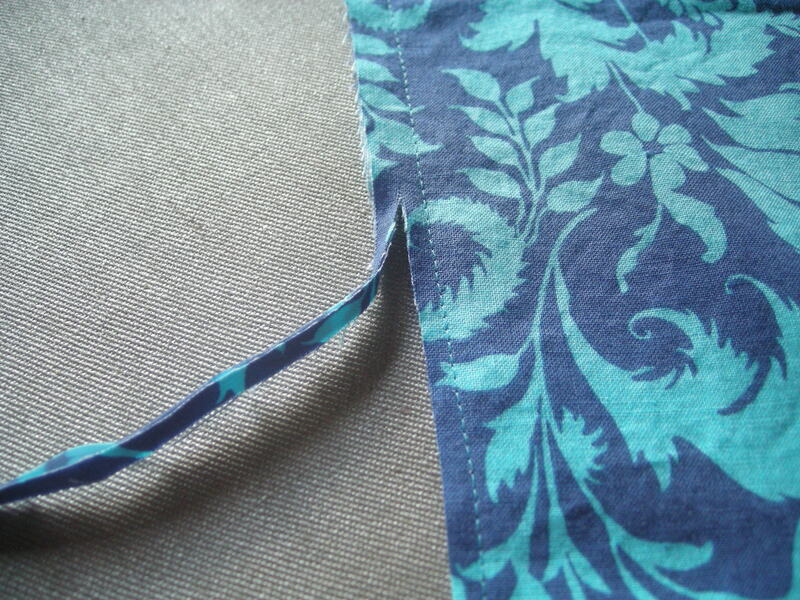 On the left is a bolt of Pellon (a brand of non-woven interfacing), available at any sewing store for around $3 a yard. I use my 40% JoAnn coupons on this stuff, buying the biggest bolt I can find so that I always have plenty. The pre-printed blue grid lines are one inch square, and that fact makes this stuff a worthy investment. It’s sheer enough to lay over the pattern tissue and trace, and if you know you’re moving thus-and-so line an inch, that inch is already marked on the Pellon. 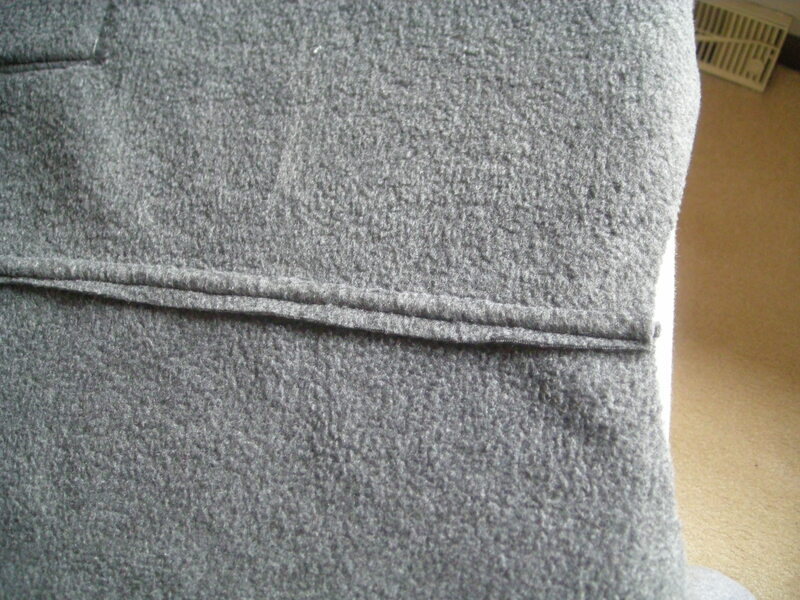 (Online sources: Amazon, fabric.com, ShopPellon.com) You can also sew this stuff, so it can double as a muslin for tricky to fit items like boned corsets. You can write on it with a Sharpie or other marking tool, but it is slightly prone to bleed-through, so mind what you have under it. In the middle is a roll of plain paper. It’s slightly sheer, resists bleeding, and is about 18″ wide — I look for rolls in the 18-24″ width range, which seem to work best. This particular roll is from Staples, but this sort of paper is available at any office supply store. 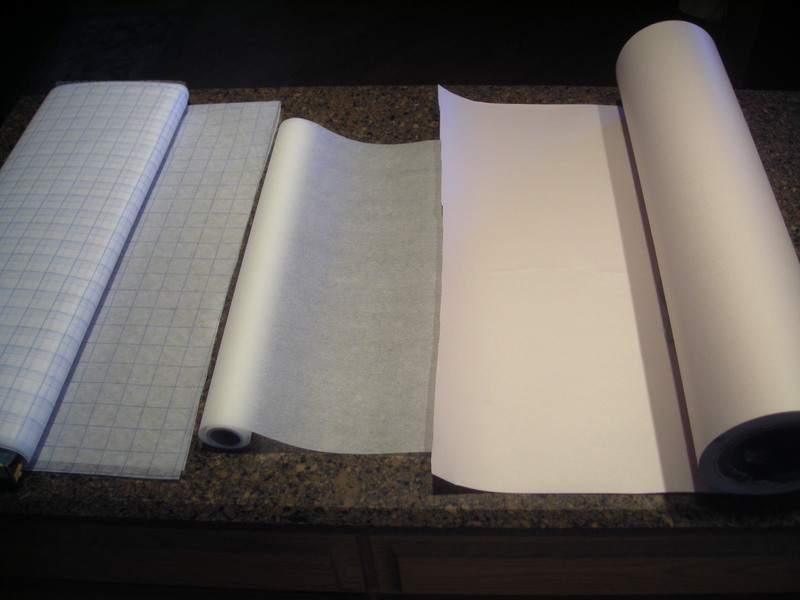 Look in the art paper area for banner rolls, but avoid Kraft paper, which is opaque. Something slightly sheer works better. 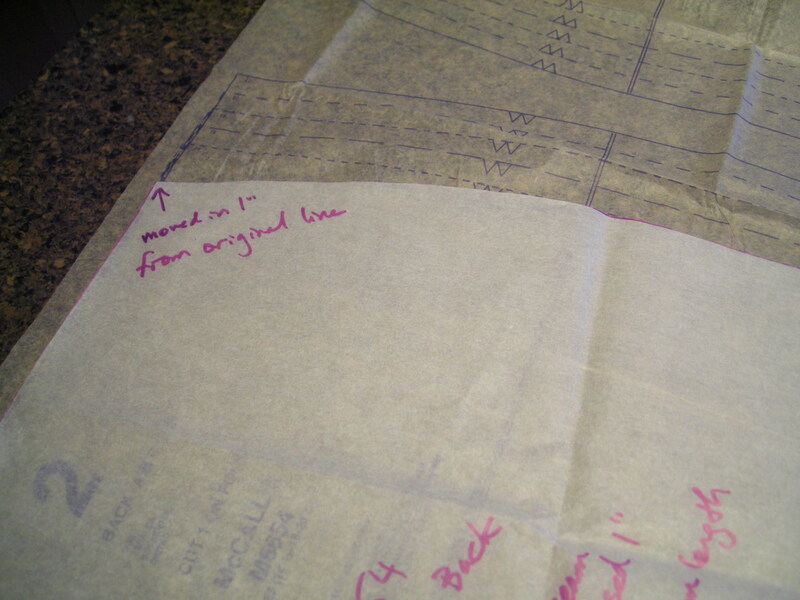 I lay this paper right over the pattern tissue and trace the size I want, and then alter on paper from there. On the right is an end roll of newspaper. A friend’s husband works in periodical publishing and he provided this, but you can often get these just by stopping into the local news office and asking. They ordinarily give away the end rolls if they have any handy. I know area school teachers who use this stuff for all sorts of classroom decorations, are projects, disposable table covers, and so on. It’s opaque, so I tend to use it to make copies of existing pattern piece — something I’ve done pretty regularly as I’ve lost weight and needed to adjust my slopers. 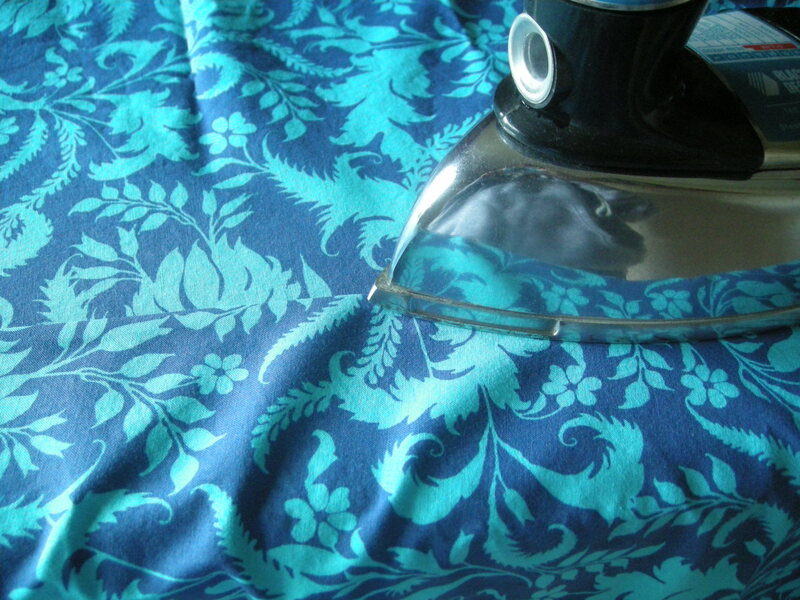 I also use this when I decide I would like to take an existing t-shirt pattern and make it into a tunic or dress, for example — bigger alterations to existing patterns where I want to preserve the original pattern. 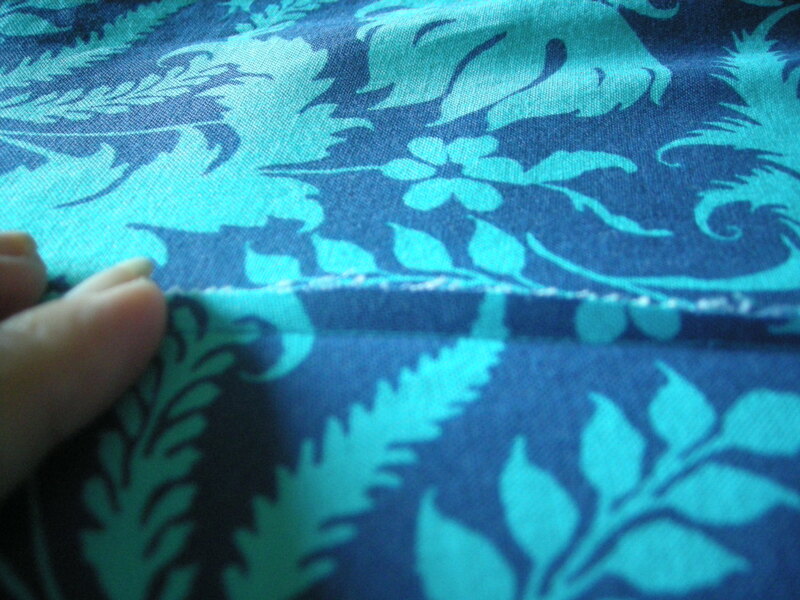 So, first I measure the pattern tissue at certain key points — in this case, the waistline, but I also measured hips. On most commercial patterns, the hip line will be 9″ below the waist line, so even if it is not marked, you can still estimate where the hip will be. 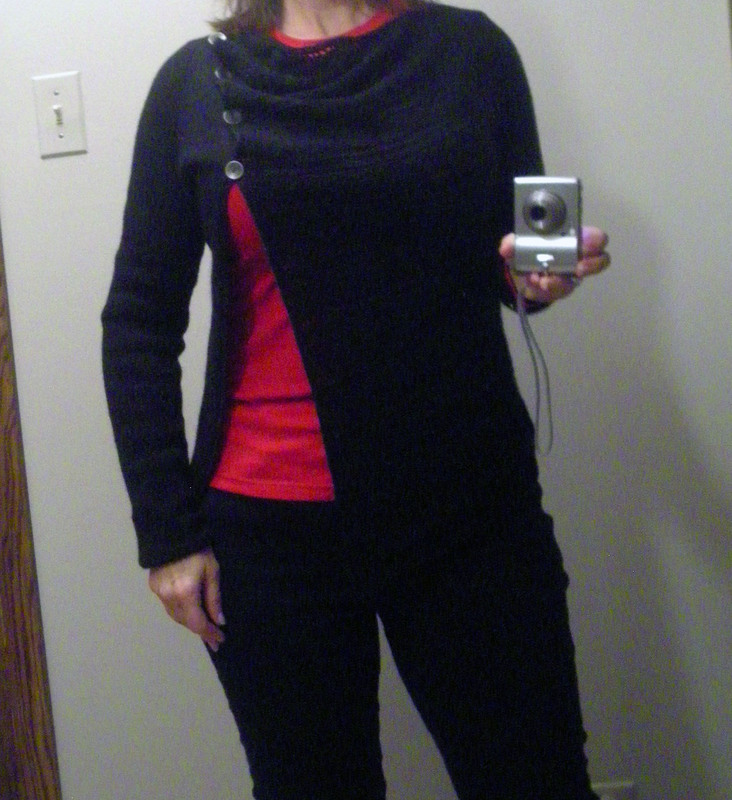 (In my case, I measure the hip around 7-8″ below the waist because I am petite.) 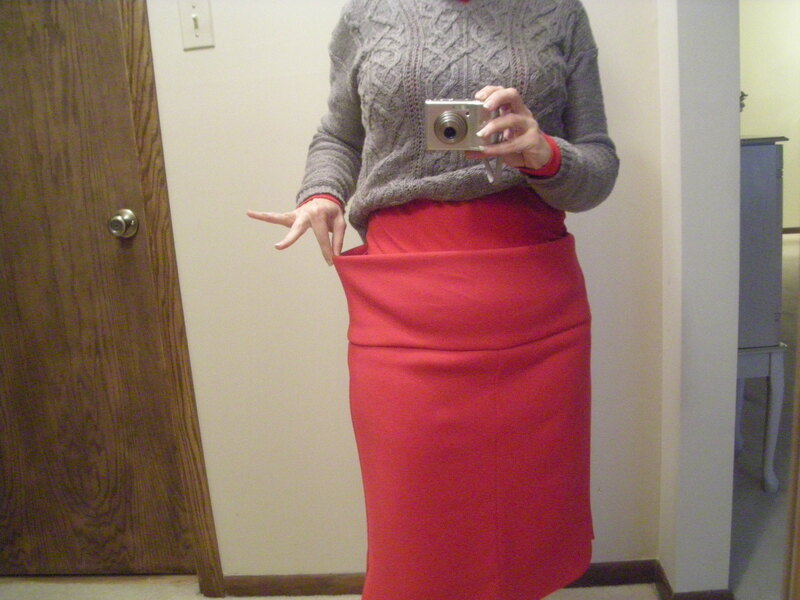 In this case, the hip was a good measurement for my body, but the waist was pretty big. 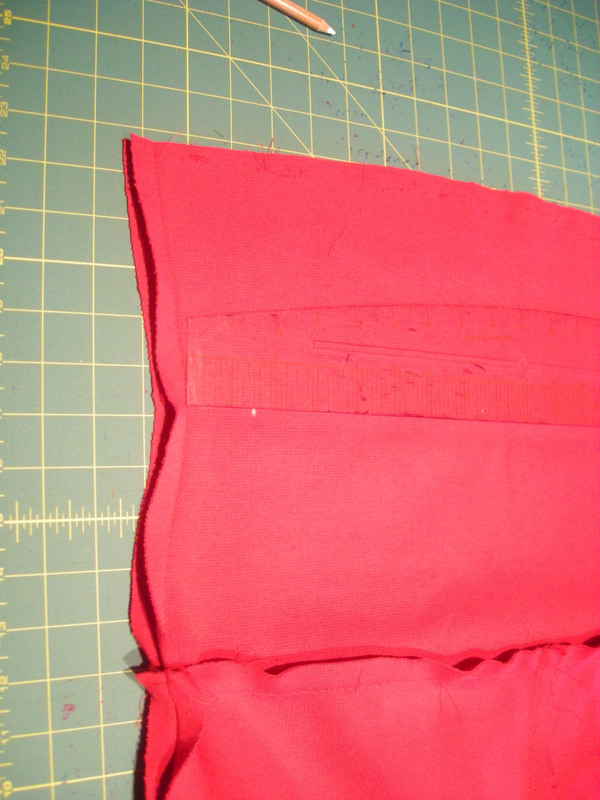 The smallest waist measurement for this particular skirt back piece was 9.5″. This piece is cut on the fold, as is the front piece. So, we subtract the 5/8″ at the seam allowance from the 9.5″ (9.5 – 0.625 = 8.875) and then double the answer because this piece is cut on the fold (8.875 x 2 = 17.75). 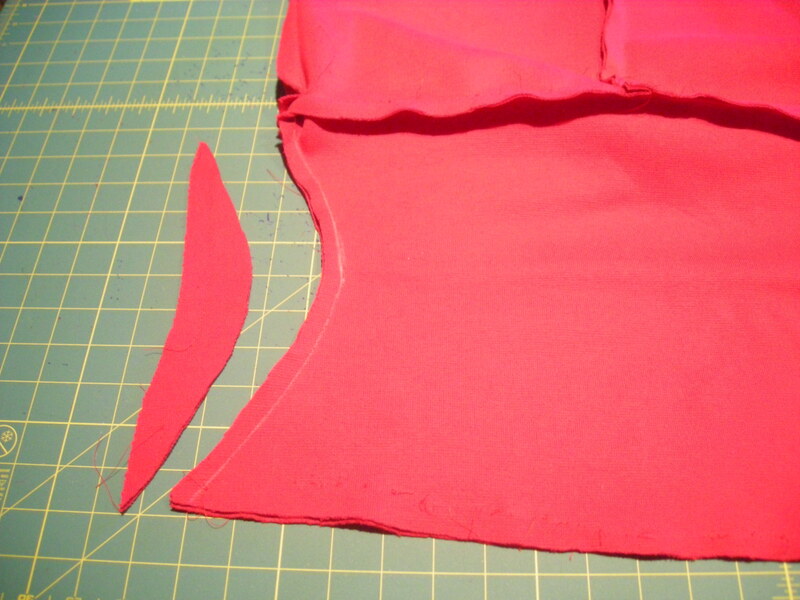 The finished back piece will thus measure 17.75″ across the waist. 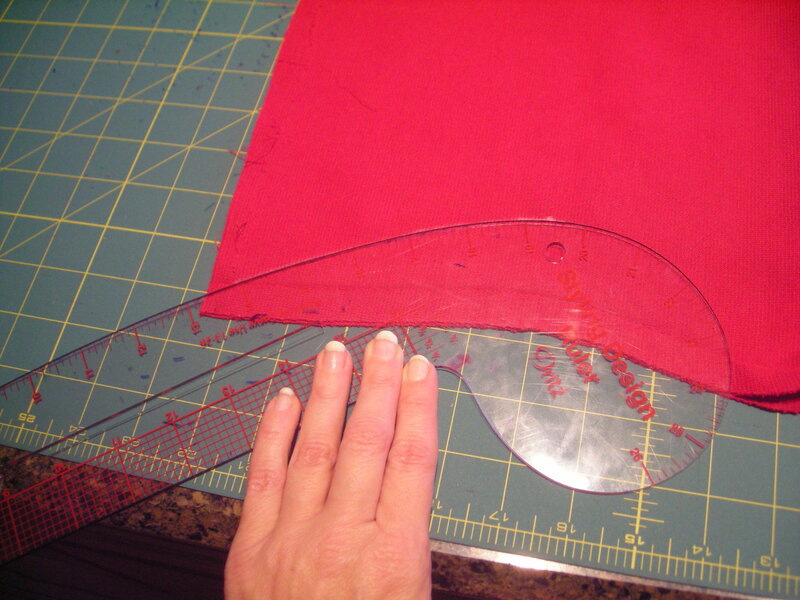 The front piece was identical, meaning the finished waist would have measure 35.5″ wide. This is where a bit of self-awareness comes in, but first we have to talk about ease. “Ease” is the word we use to describe the difference between body measurements and garment measurements. Positive ease means that the garment is larger than the body. 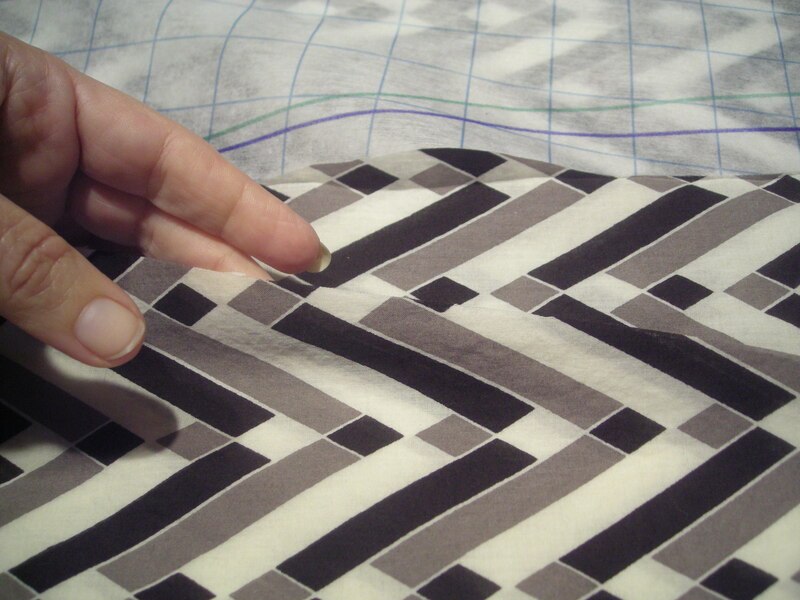 Negative ease means that the garment is smaller than the body (often found in knitted garments). 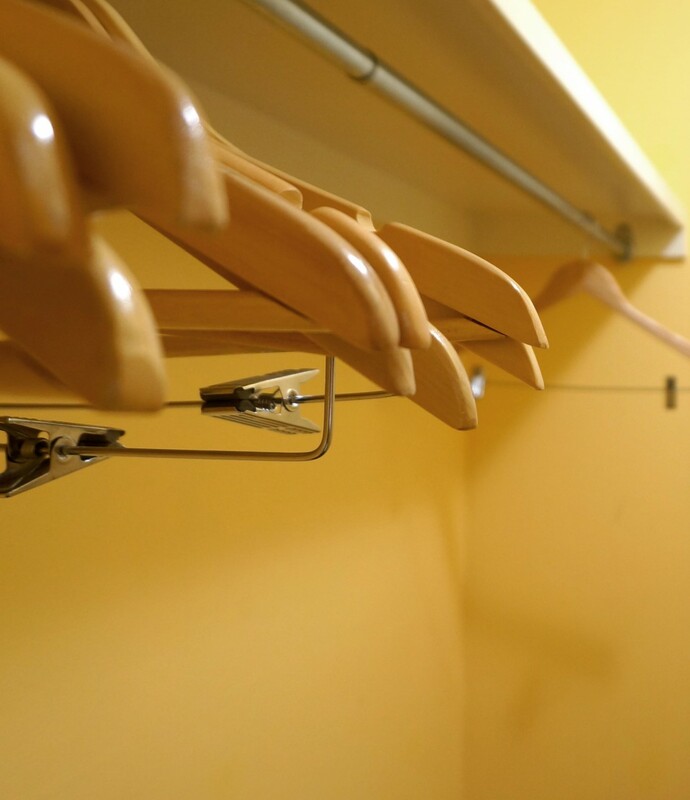 Wearing ease is the standard amount of positive ease that will make a garment fit comfortably at key measurement points, such as waist and bust — the measurements printed on the pattern envelope are places where ease is measured routinely. 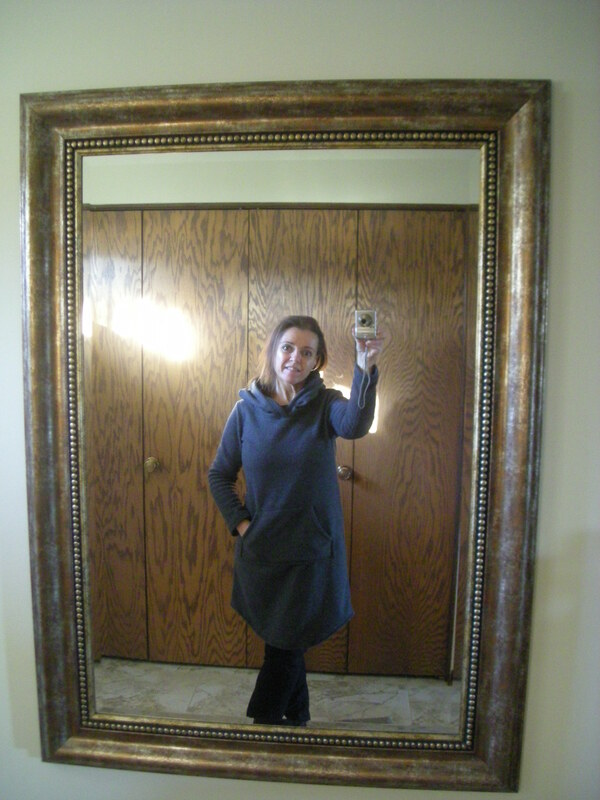 Then there is design ease, which is what the designer adds or subtracts to make the garment look a certain way. 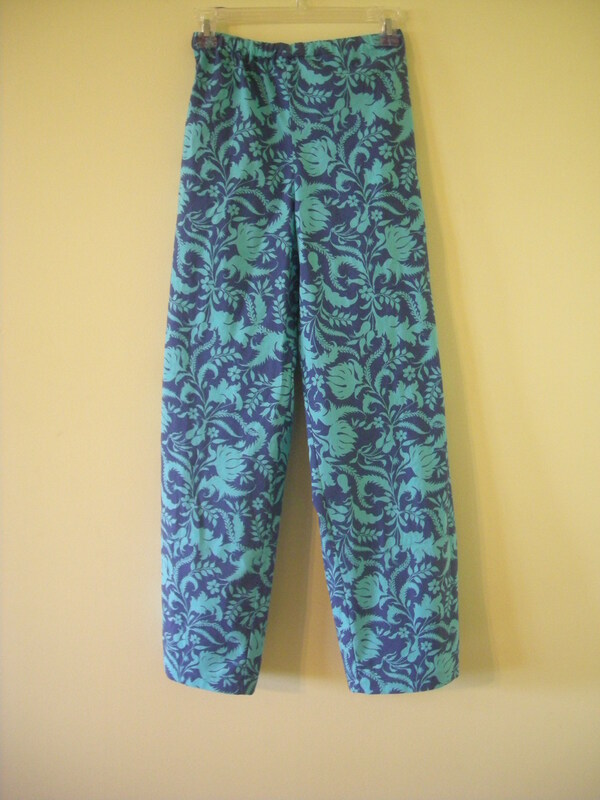 Cigarette pants have minimal design ease through the legs, and palazzo pants have a ton of design ease in the same place, which is why the two kinds of pants look so different. Also, woven fabrics will need more ease than knitted garments because knitted garments will stretch and move with the body in ways that woven fabrics will not. So. I know that for me, my waist measurement is just a notch over 29″ right now. 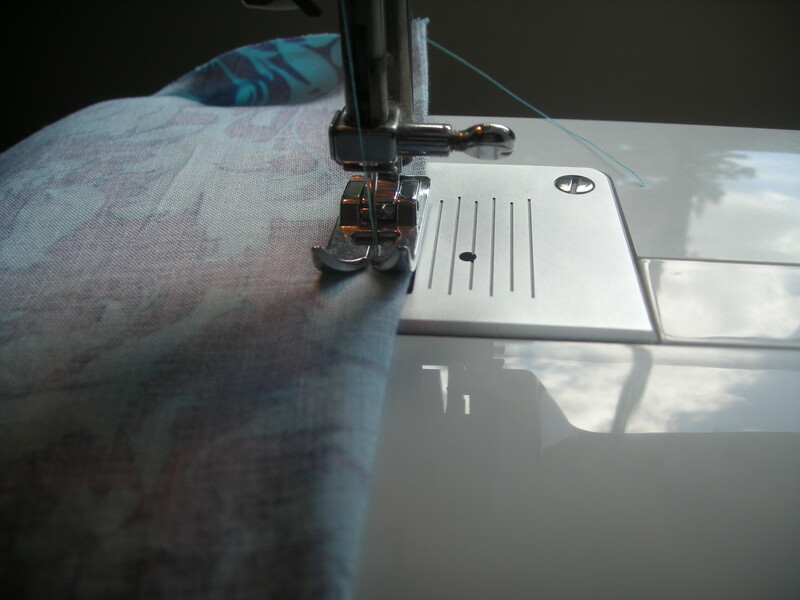 And I know that with an elastic waistband, I measure the elastic piece to have an inch of negative ease, so about 28″ once it is lapped and sewn. This is the self-awareness part — I know that anything bigger than that, in an elastic waistband, will feel droopy to me and I’ll spend the day tugging on my waistband. The waist on that pattern measures to 35.5″, and I would want to use elastic to draw in 7.5″ of that, which seemed like a lot to me. I don’t like the way a very gathered waist looks on my body — dirndls are just godawful hideous on me these days. 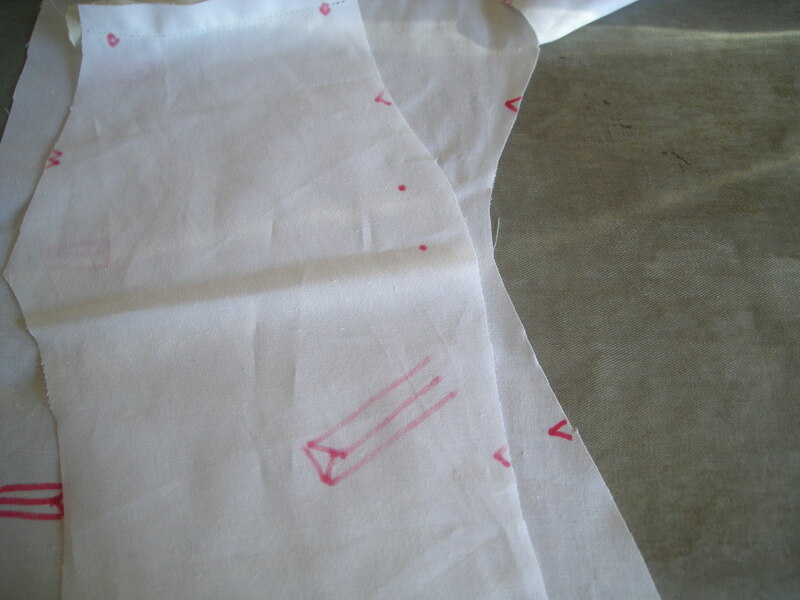 So I knew I wanted to remove some of that excess, and I started by marking a point 1″ in on the side seams at the waist on the pattern piece. 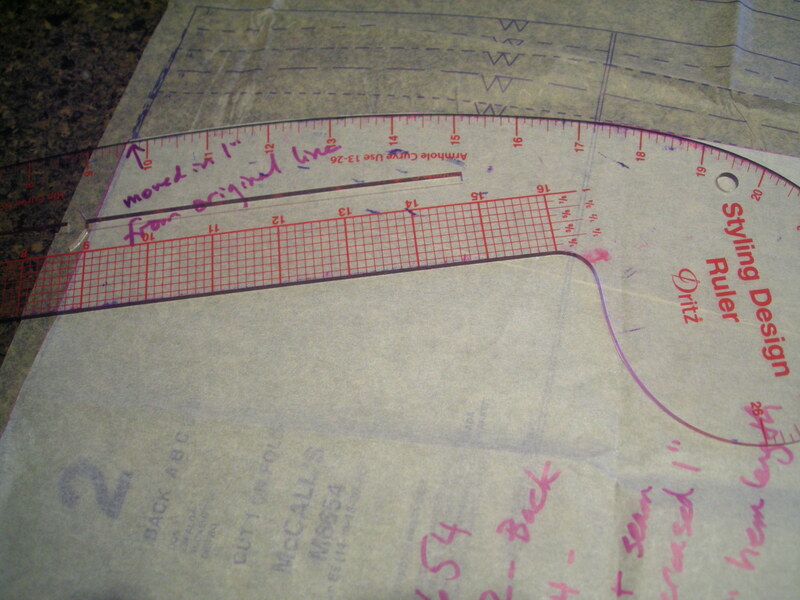 Then I used my drafting ruler to draw a new curve from that point to the hip. I also marked the alteration on the pattern piece, only because I know from experience that I can never remember what I did. And that’s it. That 1″ adjustment on the front and back pieces removed 4″ from the waist, reducing it from 35.5″ finished to 31.5″ finished measure. I still used the 28″ waistband elastic finished measurement, so that meant the waistband was gathered slightly but not much. I also trimmed a bit off the waistband pattern piece, which was a plain rectangle with no waist shaping, so this meant simply hacking off four inches there, too, without worrying about waistband shaping. 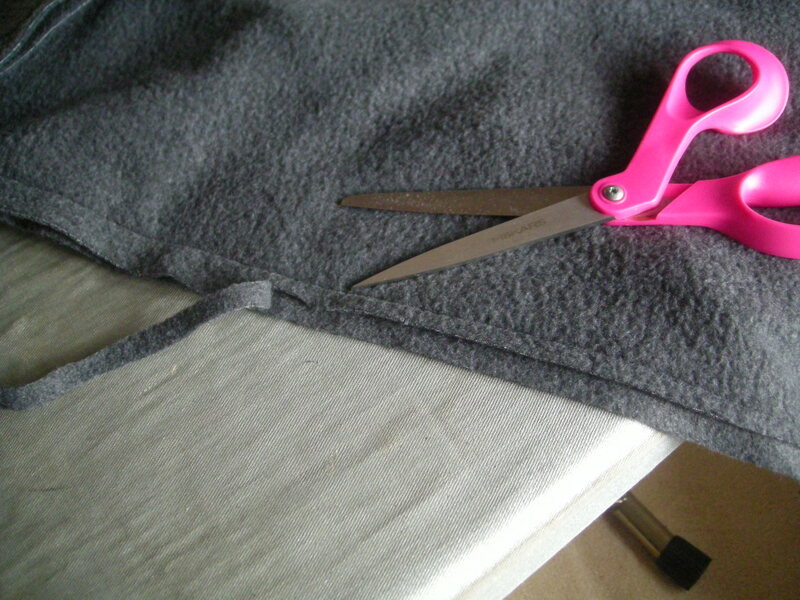 This particular alteration is among the easiest to make, and I make it as a matter of routine on my skirt and pant waistbands.